Class C motorhomes offer the best of both worlds. They’re spacious and filled with features like many travel trailers and fifth wheels, but they’re convenient to move from one destination to another like most motor coaches. The 2017 Jayco Redhawk combines industry-leading luxuries with unrivaled stability and precise handling to create an unbeatable RV travel experience. The 2017 Jayco Redhawk is available in six unique floorplan options to suit a wide range of travelers. Whether you’re interested in a massive master suite, a larger living area, a U-shaped dinette or even bunks for the kids, there’s a 2017 Jayco Redhawk that’s guaranteed to suit your travel wants and needs. When you travel in the 2017 Jayco Redhawk, you won’t wish your home on wheels had any additional features. This Class C motorhome is loaded with frameless windows, a 32-inch LED flat-screen, heated holding tanks, a rear back-up camera and monitor, a 12-volt electric patio awning, an outside shower, electric-powered entrance step, honey cherry cabinetry, an 84-inch ceiling height, a water filtration system and all of the features you need to stay on the road as long as you please. The 2017 Jayco Redhawk is engineered to provide the ultimate driving experience. Jayco’s JRide system combines precise handling and unmatchable stability to create a ride that feels more like a luxury sedan than a spacious Class C motorhome. 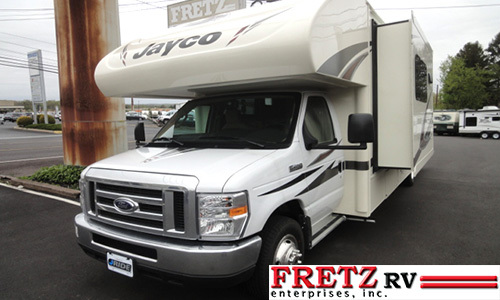 A number of 2017 Jayco Redhawk models have already hit our lot here at Fretz RV in Souderton, Pa. Come tour this luxury Class C motorhome and experience the JRide feel to ensure this is the RV for you before you buy. And if you’re not interested in a Class C motorhome, our Fretz RV sales professional will help you find your dream RV for an affordable price.